Archaeologists in Denmark have uncovered an incredibly rare find: a stone age axe held within its wooden handle. 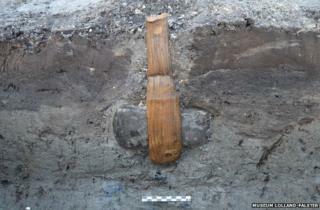 The 5,500-year-old Neolithic axe was found during archaeological surveys ahead of a multi-billion euro tunnel project. The axe seems to have been jammed into what was once the seabed, perhaps as part of a ritual offering. The lack of oxygen in the clay ground helped preserve the wooden handle. The find was made in Rodbyhavn on the Danish island of Lolland, which is to be connected to the German island of Fehmarn via the tunnel link. "Finding a hafted [handle-bearing] axe as well preserved as this one is quite amazing," said Soren Anker Sorensen, an archaeologist at the Museum Lolland-Falster in Denmark. Archaeologists have found other similarly well preserved organic material in the area during their excavations. These include upright wooden stakes, a paddle, bows and other axe shafts. Axes were vital tools for Stone Age people, who used them for working wood. However, they also played an important role during the introduction of farming to Europe, when the majority of the land was covered by dense forests. The archaeologists suggest that the Neolithic communities of south Lolland may have been using the coast as an offering area. Earlier this month, archaeologists working on the Fehmarn Belt Tunnel scheme announced that they had uncovered 5,000-year-old footprints along the edge of an ancient fish trap excavated at Rodbyhavn.